Hyssops are great for adding vertical accents to a border, with whorls of long-lasting, tiny flowers arranged like a bottlebrush and pointed, aromatic fresh green leaves that are attractive to butterflies and bees. They are short-lived though, and may need replacing every few years, especially after a cold or wet winter. 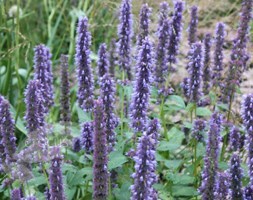 Blue Fortune has loose spires of lilac-blue flowers from July to October and peppermint-scented leaves. This upright, bushy perennial is perfect for the middle of a sheltered, sunny border. Try it as part of a Mediterranean scheme, with grey-leaved plants, or among ornamental grasses.